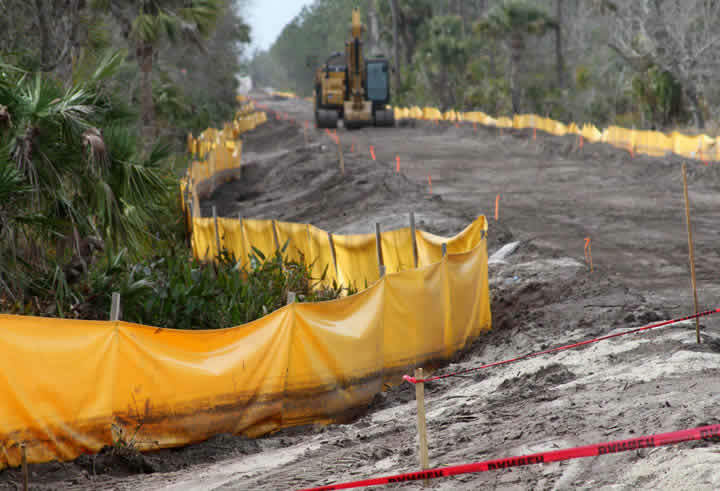 Impermeable Staked Turbidity Barriers (also called staked silt barrier) is a robust option for construction sites with significant sheet flow, stormwater runoff, sediment erosion, or site discharge. It is ideal in water depths less than thirty inches (30"). This fencing can add the strength required for demanding runoff control or contaminated water flows. It can also redirect stormwater to help avoid flooding. Triton Staked Silt Barrier uses an impermeable PVC fabric that is high in resistance and strong enough to withstand use in demanding locations. 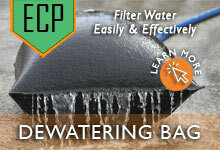 It is DOT compliant for use as a stormwater Best Management Practice (BMP). Questions? Give us a call at 1-772-646-0597 or contact us. Dig a trench along the desired control path. Install 1" x 1" wooden stakes (or rebar) on the down slope of the trench. 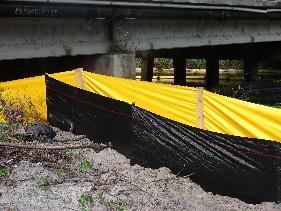 Unroll the staked silt barrier fabric. Fasten the fabric to the fencing. Once the fencing has been installed, backfill the trench. As with any silt fence or BMP, fencing should be inspected periodically on a maintenance schedule and after each rain fall event. 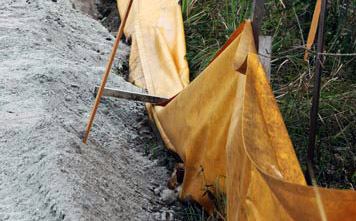 Staked Silt Barriers should be inspected for any gaps or tears in the material. Also, remember to remove any accumulated sediment. Readjust and reposition stakes that may have fallen or moved. 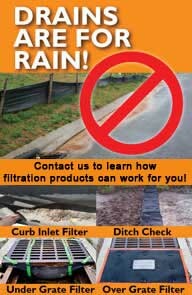 A well-maintained staked silt control fence can make a big difference in sheetflow and runoff control effectiveness. For additional stormwater and sheetflow runoff filtration, couple the use of Triton Staked Silt Barrier with black permeable silt fence. GEI works offers several styles of geotextile (permeable) silt fence to accomodate your project's needs. or fill out our quote request form to discuss your project's needs.